Taxes already make up about 60 percent of the price of fuel in France. The average cost to fill a tank in France runs about $7 per gallon. 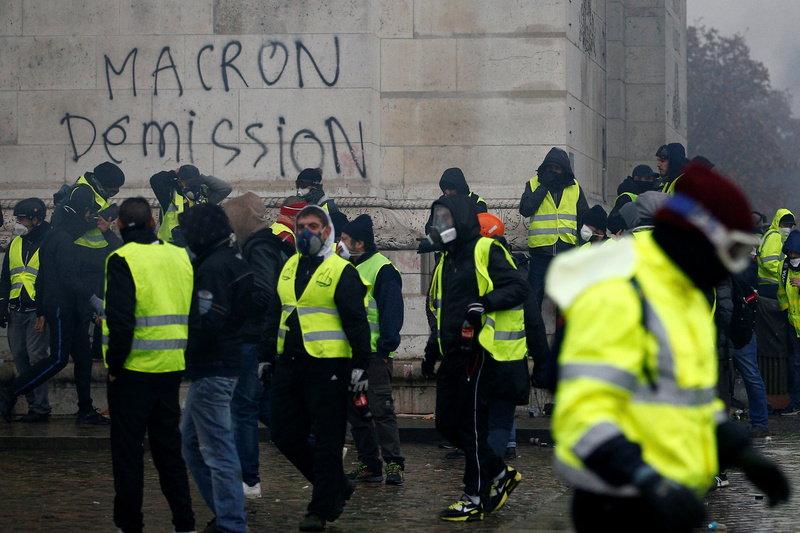 The message “Macron Resign” is seen on the Arc de Triomphe as protesters wearing yellow vests, a symbol of a drivers’ protest against higher diesel taxes, demonstrate at the Place de l’Etoile in Paris, France, December 1, 2018. REUTERS/Stephane Mahe. The protests, the worst to hit Paris in 50 years, were also fueled by years of pent-up resentment against Macron’s policies. At least four people were killed in the rioting and hundreds were arrested. Macron initially resisted any compromise with protesters, criticizing them for wanting to help the environment but not want to pay for it. Macron’s government already raised carbon taxes on fuel earlier this year. Macron’s retreat on carbon taxes comes as the United Nations hold its annual climate summit in Poland. U.N. officials called for world leaders to do more to reduce greenhouse gas emissions blamed for global warming.